Letting the sun shine down on your body feels great doesn’t it? You may not even know why you feel so good when you are out on the perfect sunny day. One of the reasons is that sunshine provides our bodies with vitamin D. This vitamin is important for many reasons, one of which is improving our overall mood. Ever notice how everyone seems to be down on a rainy day? Even with just a day of gloom, our vitamin D levels can go down and cause us to feel sad. The only way to truly find out if you are vitamin D deficient is to have blood work completed. However, there are some signs that you can look for to see if you should have your vitamin D levels tested. As mentioned already, vitamin D can affect your mood. If you are feeling sad all of the time and ultimately depressed, you may need some vitamin D. Serotonin, which is the hormone in the brain that is associated with elevating your mood will rise when exposed to bright lights. Serotonin levels fall with less exposure to the sun. Another sign that you may be vitamin D deficient is aches in your bones. Many people go to their doctor for these pains, especially if they are combined with fatigue. Often times a misdiagnosis of chronic fatigue syndrome or fibromyalgia is given. If you have aches and pains make sure that your doctor tests your blood for vitamin D deficiency before accepting a diagnosis of one of the above. If you sweat a lot around your head, you may need more vitamin D. A sweaty head is one of the first signs that doctors look for when considering vitamin D deficiency. Pediatricians will often ask new mothers if their newborns have a sweaty head as this is an early sign that they may need more vitamin D.
One final sign that you may need to have your vitamin D levels is if you have trouble with your stomach. If you have any type of gastrointestinal condition that affects how your body absorbs fat, you may struggle absorbing vitamin D as well. People who are over the age of 50 and those who have darker skin are more likely to be vitamin D deficient. 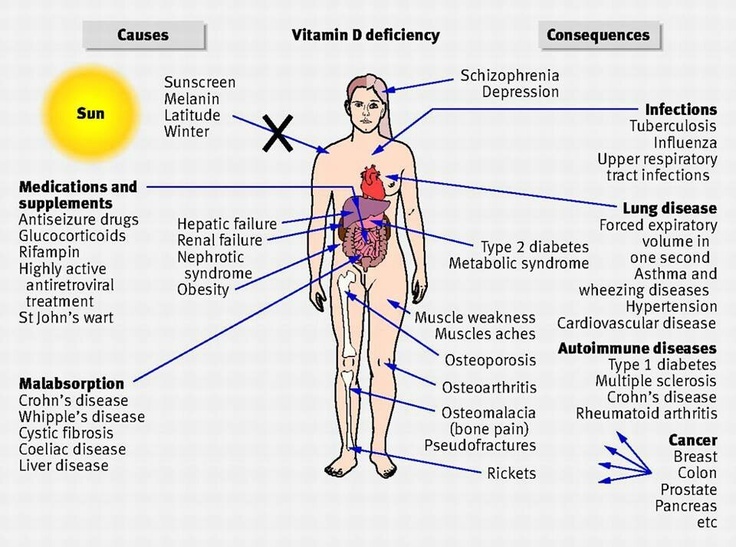 Vitamin D offers us many health benefits. Individuals who have normal amounts of vitamin D are less likely to develop some forms of cancer including breast cancer in women. In addition, it helps to fight off infections such as the flu and colds as it helps enhance your immune system. Vitamin D can also reduce the risk of heart disease, lower blood pressure, and reduce the risk of having a stroke. If you think that you may have a vitamin D deficiency, you should visit your doctor to be tested. If you find out you are deficient, make sure that you get out into the sunshine more often as this is the best way to boost levels.